Essential oil blends have been used for centuries to battle germs, plagues, illness and the doldrums. Spray it in rooms, laundry, counters and everything else to sanitize, purify, neutralize odors and sooth the senses. 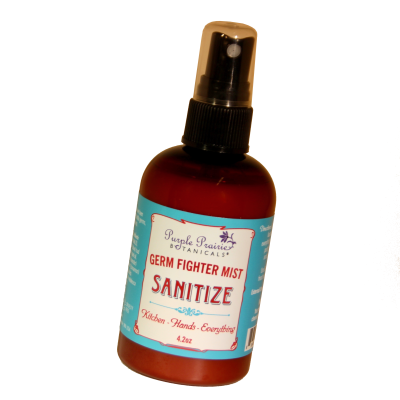 Use Sanitize daily for a fresh and healthy home. 4.2 oz. 98% Natural Ingredients: distilled water, polysorbate 20, syzgium aromaticum (clove) bud oil, citrus limon (lemon) peel oil, lavandula angustifolia (lavender) oil, cinnamomum verum (cinnamon) bark oil, eucalyptus globules (eucalyptus) leaf oil and melaleuca alternifolia (tea tree) oil. Clove Bud Essential Oil Pure undiluted Essential oil of Clove~ amber glass bottleBotanica..
Certified Organic Eucalyptus Essential Oil Pure undiluted Essential oil of Eucalyptus. A..
Certified Organic Lemon Essential Oil Pure undiluted Essential oil of Lemon. Amber glass bott..